The publication of this year’s Himalmedia Public Opinion Survey last week coincided with a surge in political street action in the wake of the attempt by the Big Four to push through a draft constitution with a six-province model. 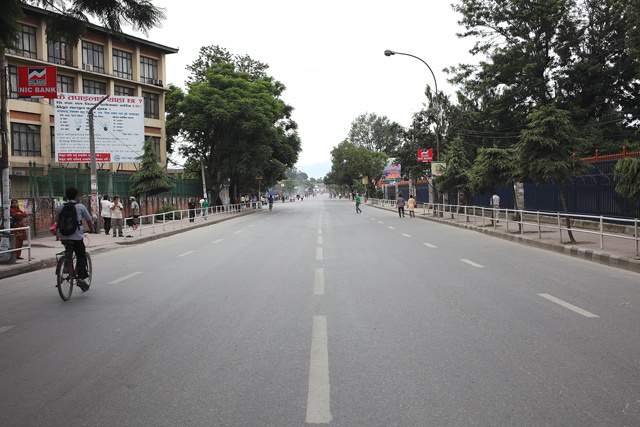 Ironically, the Survey showed the people’s strong dislike for political instability and frequent strikes at a time when the country was paralysed by an indefinite Tarai shutdown, unrest in Surkhet, Jumla and other towns in the mid-west, and a series of strikes in Kathmandu by political entities angry over boundaries of federal provinces. Political parties from the left, right and centre are never tired of saying that they are for the people. But it is the people they punish to score political points against rivals. The Maoists killed people in the name of their ‘people’s war’. The NC and the UML spent a large part of the 1990s squandering the hard-won gains of the democracy movement by hitting back at each other by shutting the country down. When the Maoists ended the war, they started behaving in exactly the same way: leaving people stranded along highways, terrorising bus companies, burning taxis with drivers still inside. Businessmen lost business, daily-wage labourers lost their income, the country’s economy took a direct hit. Actually we don’t need to periodically go to the people to feel their pulse through public opinion surveys. Just go out and talk to anyone on the streets, nine in every 10 people would probably tell you: they are sick of shutdowns and politicians. They want the parties to stop infighting. Polls like the Himalmedia Survey just quantify this overwhelming public mood. But it doesn’t seem to matter to the political parties or leaders what the people think in this dysfunctional democracy. In the past political parties and leaders have welcomed results of opinion polls if they come out in good light, and reject them as biased if they don’t. It’s the same this time. What the politicians forget is that their popularity ratings are nearly all in the single digit, and more than half the respondents are fed up with the whole lot of them. Even when the public’s feedback was collected on the draft constitution in June, political parties just cherry-picked the suggestions which suited them. They instantly agreed to bring down the number of federal provinces, but ignored people’s concerns for a directly-elected executive and citizenship through the name of the mother. People knew politicians would end up doing as they liked, so 80% of those we polled said they hadn’t even bothered to give suggestions. 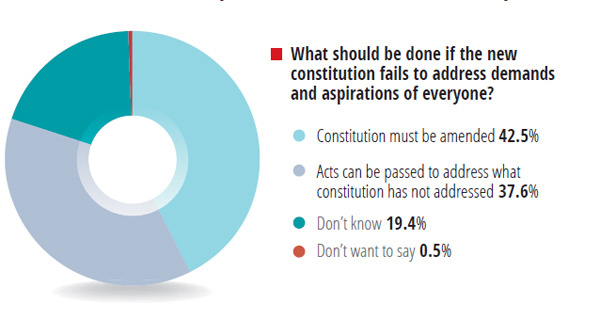 The results of the Himalmedia survey have reinforced the fact that most Nepalis are not bothered too much about the constitution or form of federalism, they are more worried about day-to-day issues like the rise in prices, joblessness and corruption. Needless to say, they want the new constitution just because they hope that their living standards will be improved through political stability. Unfortunately, the economy is the last thing in the agenda of most politicians. More than half the 3,517 people in 35 districts who were interviewed in early August said they were ‘just managing’ two square meals a day. And 14% said it was difficult for them to make ends meet. Only 30% said their earnings were sufficient. Of the 70% respondents struggling to survive, 18% said they were planning to go abroad. And nearly 85% of them say they will not leave the country if they can earn up to Rs 30,000 in Nepal itself. These may seem like trifling matters to politicians discussing grand themes such as federalism and forms of government. But they carry a vital message: most Nepalis are just surviving, they blame politicians for messing things up, and they are looking for a strong visionary leader. That message doesn’t seem to have sunk into the heads of the politicians in government and opposition, and even if it has, they don’t seem to care. Nepal’s politicians of all hues would do well to study the disaggregated data from the Survey in order to begin to regain the people’s trust. People tend to vote for the same parties just because there are not reliable alternative forces. In 2008, the Maoists were fresh, untested and their slogans like ‘Try us this time’ really attracted the people. But the Maoists turned out to be no different. The result is: their leader Pushpa Kamal Dahal is now even more unpopular than Kamal Thapa and Upendra Yadav. In a functional democracy, the parties heed the people. That is exactly what is not happening in the heap of democratic decay that Nepal has become. Our parties and leaders distort public opinion as per their own convenience, hold the country and the people hostage for their own greed and selfishness, and openly show contempt for the people’s need. That is just not done.